Current nanotechnology research aims to create functional materials, devices and systems from tiny building blocks that are 1 to 100 nanometers across. A nanometer is one billionth of a meter, or about one ten-thousandth the diameter of a human hair. Scientists expect to be able to exploit a host of intriguing phenomena and properties -- physical, chemical, biological, mechanical, electrical -- by working with objects on so minuscule a scale. "There is definite progress being made," said Meyya Meyyappan, director of the Center for Nanotechnology at the NASA Ames Research Center, Moffett Field, Calif. From the basic research five or six years ago, he said, "we have actually started making some widgets." A compact chemical sensor using carbon nanotubes has been fabricated. Such a device would be ideal for use in NASA's cosmochemistry missions, Meyyappan said. Also, a carbon nanotube-based X-ray defraction spectrometer has been made, he said, a unit that offers higher performance than commercially available instruments while using less power and being far smaller and lighter. "It actually fits within my palm, and I'm a small guy," Meyyappan noted. "It should be ready for missions in 2009-2010, and we're shooting for Mars exploration ... to study the rocks and soil." NASA is spending more than $40 million a year on nanotechnology investigations, he said. "It is an enabling technology that will have an impact pretty much all across the board ... it's not any one technology," he said. The agency should keep a long-range eye on nanotechnology capabilities that might prove helpful for the Moon, Mars and Beyond agenda 10-15 years form now, Meyyappan said. "There are a couple of areas I'd zoom in on right away," he said, emphasizing advanced life-support equipment and radiation-shielding technology for crews outward bound from Earth. Nanomaterials: Carbon nanotube reinforced, lightweight materials could revolutionize vehicle design with their superior tensile strength and their ability to conduct heat and electricity. Nanorobotics: The next stage in miniaturization may lead to molecule-sized actuators and motors, or microscopic robots to aid in studying cells and biological systems, as well as nanoparticles and fibers. Microcraft: Tiny and highly capable vehicles could be developed for deep space probes, orbiters, planetary atmospheric entry probes or mobile surface explorers. Nanosensors and Instrumentation: Tiny, wireless, fast, super sensitive and non-invasive sensors and instruments could be fitted with chemical, electronic or optical detectors for science missions, particularly for use in on-the-spot analysis and robotic operations. Nano-micro-macro Integration: Nanotechnologies could be incorporated into systems useful on a more human scale, such as life support equipment and environmental monitoring systems. Astronaut health management: Space travelers on lengthy voyages could use nanotechnology to combat high-radiation environments, to fabricate medical monitors and healing devices, and to help reduce or overcome the stresses and strains stemming from long-term space treks. "I think in the short term what you're going to see are increments of progress," said Scott Mize, president of the Foresight Institute, based in Palo Alto, Calif. The nonprofit foundation's goal is to educate the public about the ramifications of progress in nanotechnology. "When you think about nanotechnology, you have to appreciate that we're at the beginning of an arc that's going to take several decades," Mize said. Do not look for giant leaps in nanotechnology at the moment, rather small incremental steps -- already showing up in some sensor work, even actual commercial products -- from cosmetics to sporting gear, he said. "In the long run, at some point in time, you'll see radical new types of technology. But that's going to take a lot more research," Mize pointed out. Mize said the Foresight Institute is examining how nanotechnology can address a set of major challenges faced by humanity today. On the group's top 10 list -- along with combating infectious diseases, treating and eliminating cancer, and providing clean water to all -- is enabling low-cost access to space, he said. "It's very difficult to say a certain application is more important than another application in some other realm, because there are so many possibilities," Mize said. One of the more grandiose ideas for applying nanotechnology is the space elevator. Imagine a cable with one end attached to Earth on a floating platform at the equator, and the other end anchored in space beyond geosynchronous orbit. The space elevator would use electric lifts traveling along the cable to place satellites, spaceships and other hardware into Earth orbit. "Carbon nanotubes will enable us to build the space elevator and quickly move into space," said Bradley Edwards, President of Carbon Designs, Inc., Bridgeport, W. Va. The same material could reduce the mass required for the lifting equipment on a space elevator, and also lighten solar power satellites and space stations, he said. Edwards said that beyond the carbon nanotube-based materials, nanotechnologies will be used for simple thermal control surfaces and, ultimately, for more complex systems such as millions of microscopic robots that work together to form and reform into a wide range of applications. 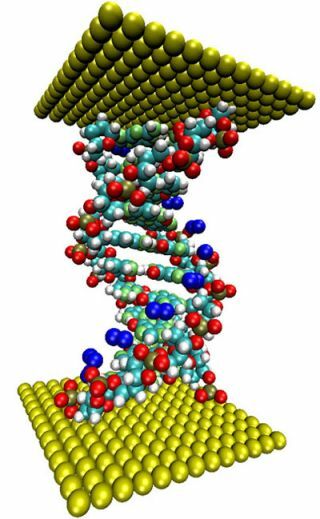 "It is difficult to predict what nanotechnology will really allow us to accomplish," Edwards said. Space elevator advocate Michael Laine noted that there are many technical problems that need to be resolved before carbon nanotube technology is ready for widespread commercial use. Laine is president and chief strategic officer for LiftPort Group of Bremerton, Wash. But there are hundreds of labs around the country and around the world -- notably in China -- that are tackling these problems and looking for solutions, Laine said. "Each lab is working on their specific issue. And when those solutions are combined, I expect to see a 'super-material' emerge," he said. One promising aspect of the research is "the leapfrogging effect that all these labs are getting from each other," Laine said. "One group is standing on the shoulders of another and someone else is standing on theirs. All of them are working together to create this super-material. What was once called 'unobtainium' is now within reach." The lure of carbon nanotubes, Laine said, is that they are 40 to 60 times stronger than industrial steel. "That's a world-changing technology. Every age has been defined by the material building blocks available ... such as stone, bronze, iron. The next age might be defined as the carbon age."